Iowa State's Interlock House continues to educate the public about energy efficiency and renewable energy at its permanent location at Honey Creek Resort State Park. Public tours: For tour information, call 877-677-3344. 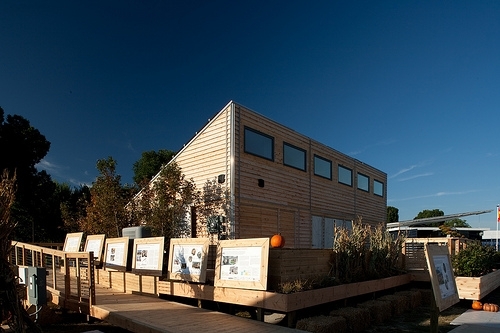 The Iowa State University team saw its vision become reality when it sold Interlock House to the Iowa Department of Natural Resources after the U.S. Department of Energy Solar Decathlon 2009. This purchase ensured the house would not only remain accessible to the public but also permanently dwell among native Iowa prairie grasses. Honey Creek Resort State Park, the home of Interlock House, is located on Rathbun Lake in southern Iowa, about 100 miles from the university. This relative proximity will allow for ongoing monitoring and research by Iowa State students and faculty in years to come. Interlock House will also accommodate a range of environmental activities for park visitors. During reconstruction in summer 2010, Honey Creek added a basement below the house to provide additional education space. "At Honey Creek, our focus is on helping people enjoy the outdoors and appreciate the natural resources we have in Iowa," says Patricia Boddy, Iowa Department of Natural Resources deputy director. "The Interlock House will not only provide us with a place to do this but also help interpret what it means to be a good steward of our resources."